I had known about Crumbs and Whiskers for a long time and was curious. They are very active on social media and the photos of the cats and the space always look so gorgeous and luxurious. I couldn’t help but wonder if the image would measure up in real life. The only booked visitor on that Friday afternoon, I was secretly delighted to discover that I was to have the whole cafe and all the cats to myself. Opened in 2017, this is the California outpost of the original Crumbs & Whiskers founded in Washington DC in 2015. Things started out on a high note the moment I walked through the door. Braun, a striking long-haired silver tabby, granted me petting privileges as I checked in with the friendly host. As I have a thing for shaggy tabbies, I fell in love instantly. Sadly, it was Braun’s time to return to back room for a rest, but as I gazed around, there were so many gorgeous felines, it was hard to believe these were rescues. Yet there they were-nearly 25 stunning, squeal-worthy beauties at every turn. One part groovy rec-room and one part love nest, the interior design is modern, yet lush and inviting. The dark walls and concrete floors (hard surfaces are necessary to keep things fresh and clean, which they are!) are cleverly offset by white faux-shearling rugs complemented by fluffy pink and gray pillows. 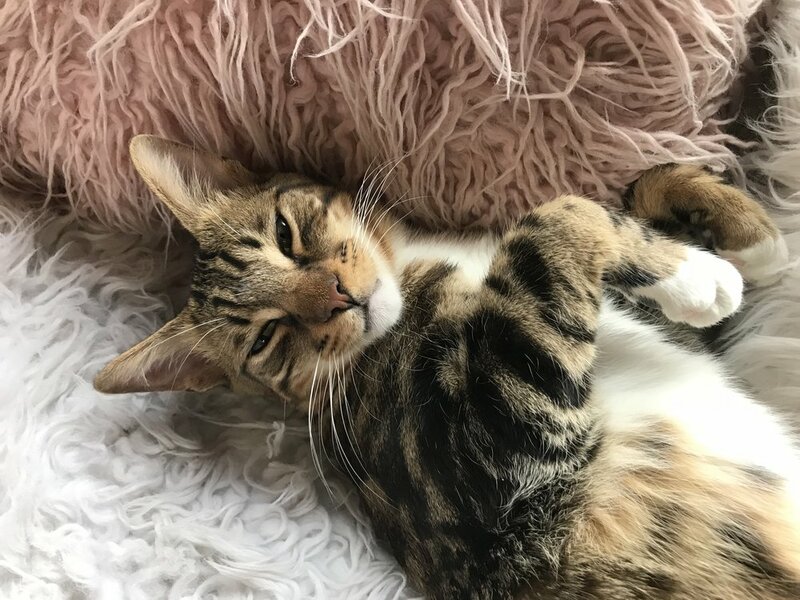 The whole scene is delightfully decadent and beckons you to get down and cuddle with the kitties- and that is very much the point- putting yourself on cat level is the best way to cultivate interaction. I did just that, a laying there with kitty bedroom eyes gazing upon me at every turn, it felt a bit seductive, almost like a feline harem of sorts, yet sweet and innocent all at once. After ten minutes I was in a haze of infatuation whispering sweet nothings and nonsensical baby talk to the cats that surrounded me. Eventually, I roused myself to take photos and by this time, two additional patrons had entered the lounge on a spontaneous visit- a couple of friends that sat in the front window while basking in the cat adoration (cat-oration?). I found myself hanging out with them, sharing smiles and giggles as the cats stretched out offering bellies for scratching. As I obliged one sassy ginger with a tummy rub, it felt like a genie was about to pop out and offer me three wishes. Even the staff were as lovely as can be. During my visit they were genuinely welcoming, friendly and happy to answer all of my questions. Throw in a great cup of coffee and it’s clear that the fine folks at Crumbs & Whiskers know what they are doing. 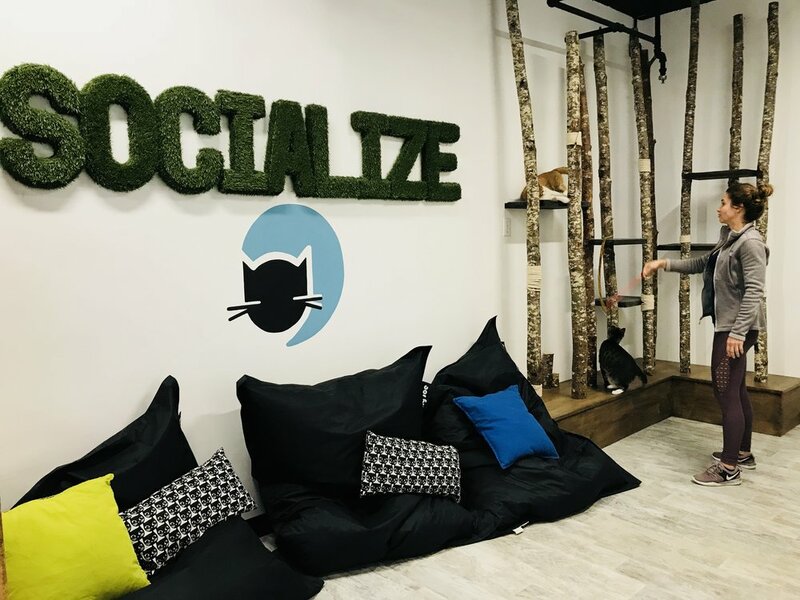 It qualifies as one of the best visits I had in 2018 and I heartily recommend you put it near the top of your must-visit cat cafe list. CatCafe Lounge had been open three months when I visited, but instead of working through the usual new business bumps in the road, things were off to roaring start. As of mid-May, 40 cats had found forever homes (79 as of November)- a tremendous achievement in such a short period. I arrived slightly early for my 11 am Saturday appointment, so I browsed around the lobby area admiring the new construction. The design is stunning- simple and austere yet striking all at once. 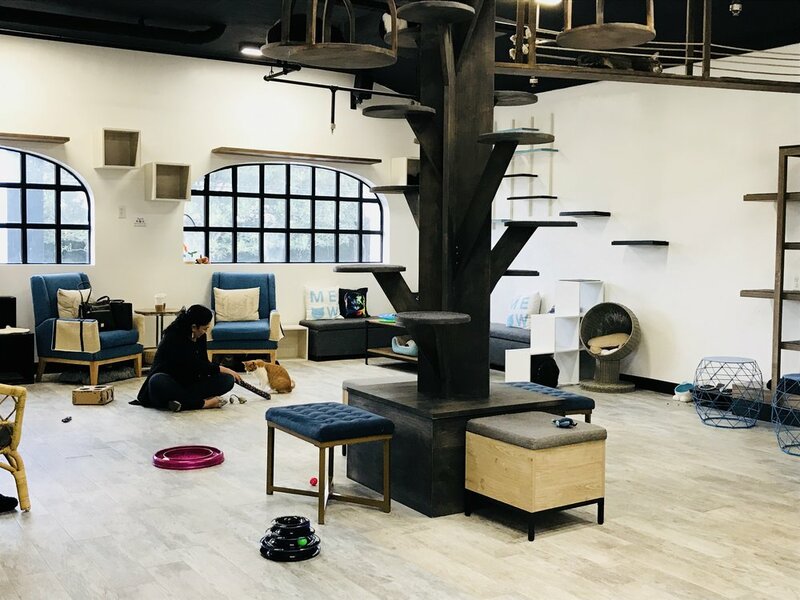 It’s also extremely ‘catified’ with plenty of napping spots and kitty toys, but the star of the house is a large wooden cat tree (modeled after one the owner saw in Japan) with plenty of perches for the kitties to get up and away from people when they need a break. There were 33 felines in residence the day I visited, which is quite a few, but the space is large and the socialization process well-established which has helped keep any alpha-cat (territorial) issues at bay. I usually take a liking to one or two cats when I visit a cat cafe, but was particularly smitten with rambunctious Oscar, a lovable tabby that turned out to be extremely photogenic when he stopped running around for two seconds allowing me to snap a picture! I was also lucky to be introduced to shy tortie Kimmy, cutie Melody and raven-haired Cleo. In between kitty love, I enjoyed a cup of tea while chatting with the friendly staff and getting the low-down on CatCafe Lounge. 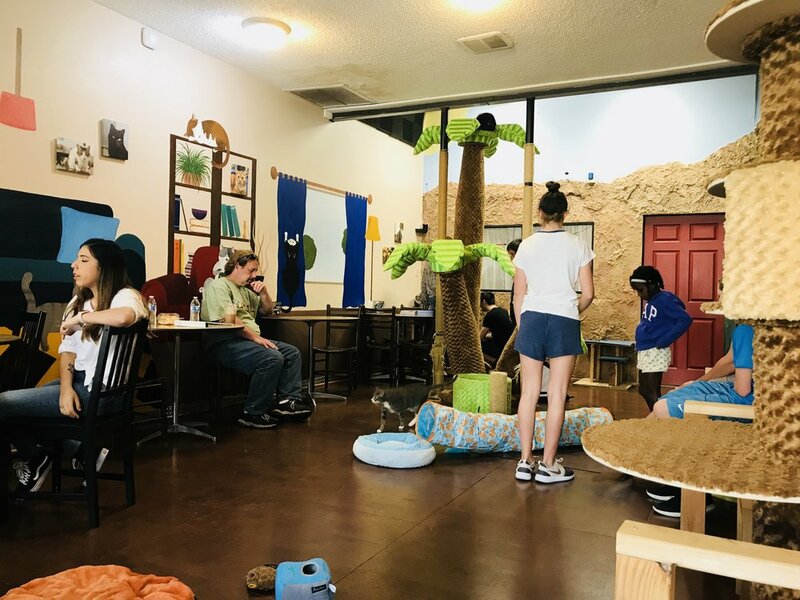 A 501c3 non-profit, CatCafe Lounge has a mission to reduce euthanization rates by socializing cats and increasing adoptions. 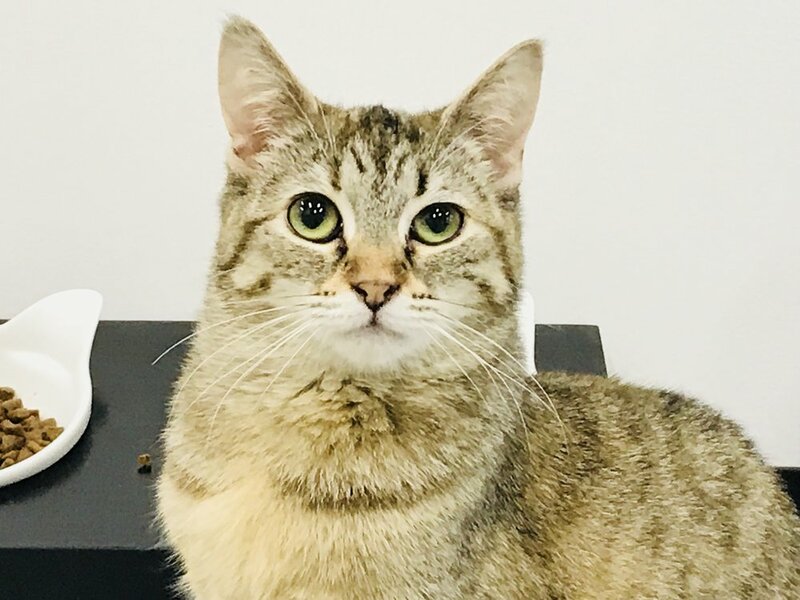 Socialization of cats previously thought to be feral or ‘unadoptable’ has become a real turning point in the no-kill movement. Traditional shelters (which are still critically important in the overall animal welfare system) can be stressful for certain cats and can cause them to be overlooked or euthanized unnecessarily. 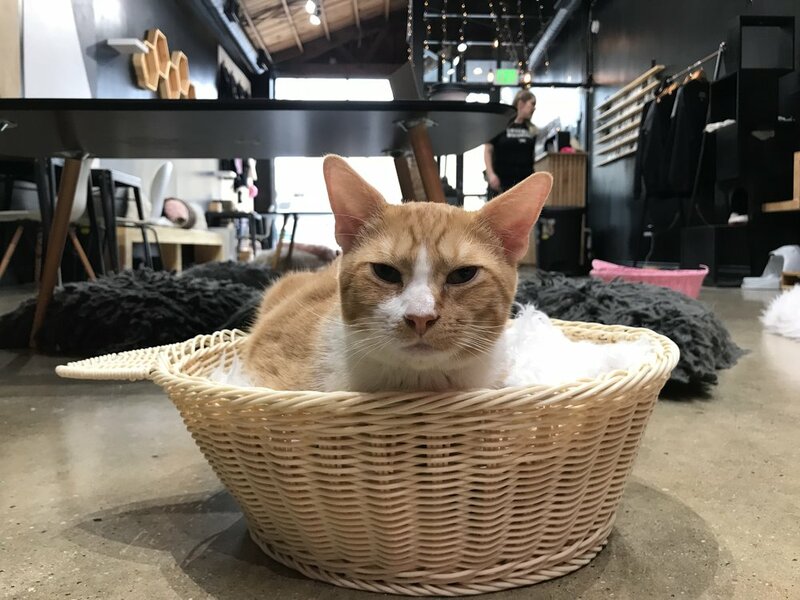 CatCafe Lounge works with Stray Cat Alliance and the Spay Neuter Project of Los Angeles as their shelter partners, both advocates for creating a no-kill nation and promoters of rescue, adoption & #TNR… all topics near and dear to this cat lover’s heart!!! The fine folks at CatCafe Lounge have created a wonderful space for humans and kitties alike. 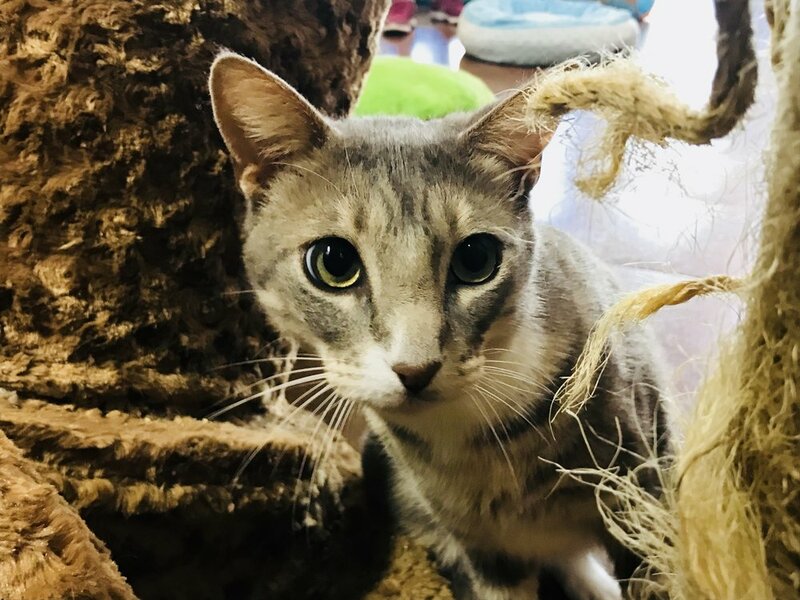 But when you factor in their important mission and high-caliber shelter partners, the magnifier effect is incredible- meaning when you visit CatCafe Lounge, rest assured your donation will truly make a difference in the life of a cat. Getting your feline fix AND helping the cats of California? What could be better? Located in downtown San Diego, The Cat Cafe makes it easy to get your kitty fix. Near Petco Park (home of the Padres) and the San Diego Convention Center, they are in the epicenter of tourist traffic which explains why they are very busy even on a weekday morning. Generally, we try to time our visits during slow hours, allowing for better cat photos and interviews with staff, but it was a full house when we arrived for our 10 am appointment. Despite the crowds, the staff were cheerful and welcoming. After placing my coffee order, included with admission we sat outside and waited with the rest of our group on the sunny patio, enjoying the perfect San Diego weather. Things are well organized in that they allow bookings in advance, but also hold a certain number of slots for walk-ins, a nice compromise for those that want to ensure their spot and those who prefer a bit more spontaneity. As the 9 am group departed, our assembly was escorted in and greeted by kind cat carer, Jolene. The ‘everyone out, now everyone in’ structure is not my favorite as it oftentimes does not facilitate a relaxing experience. 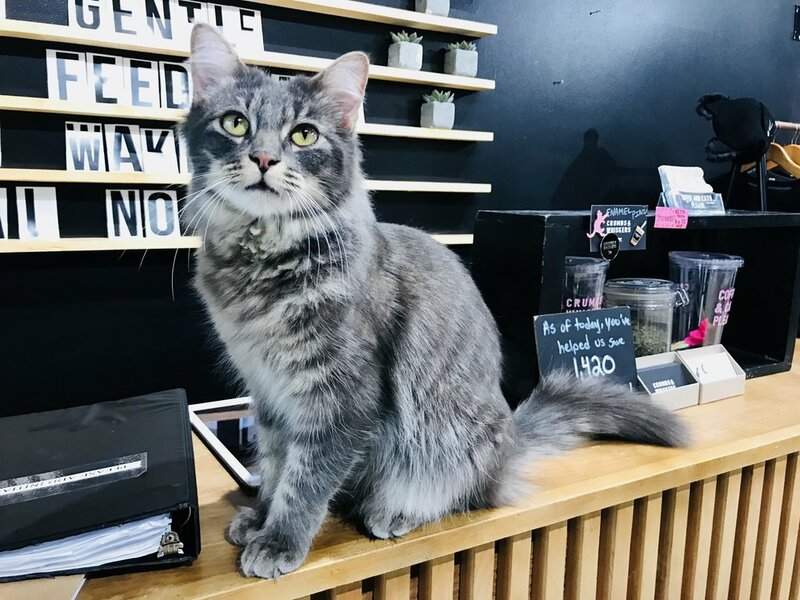 It’s a difficult situation not wanting to turn people away (it makes visitors upset) so kudos to The Cat Cafe in doing a great job giving everyone a chance to visit with the kitties. Speaking of felines, there were 12 the day we visited, sourced via a partnership with The Rescue House. Jolene pointed out the kitties in residence, including my favorites Figgy, a cross-eyed cutie, gorgeous tortie Tallulah and mischievous Charlie, who was bestowed the nickname ‘Sharp Kitty’ after watching him swipe at the hands coming close to pet him. As of March 2018, there have been 279 adoptions since they opened in 2015, a remarkable achievement considering they have a great deal of tourist traffic, but clearly there is also a supportive local contingent. Congratulations all! With several children in the room, I held back a bit so the little ones could have better access to the cats, but was able to thoroughly enjoy my hour observing the kitties, sipping coffee and chatting up Jolene. Overall, The Cat Cafe offers a quality experience with friendly staff and great coffee service.